Retired astronaut Chris Hadfield says there is a ticket to his Toronto science show waiting for a Texas teenager who was arrested and later released with no charges after his homemade clock was mistaken for a bomb. Retired astronaut Chris Hadfield says there is a ticket to his Toronto science show waiting for a Texas teenage boy who was arrested and later released with no charges after his homemade clock was mistaken for a bomb. 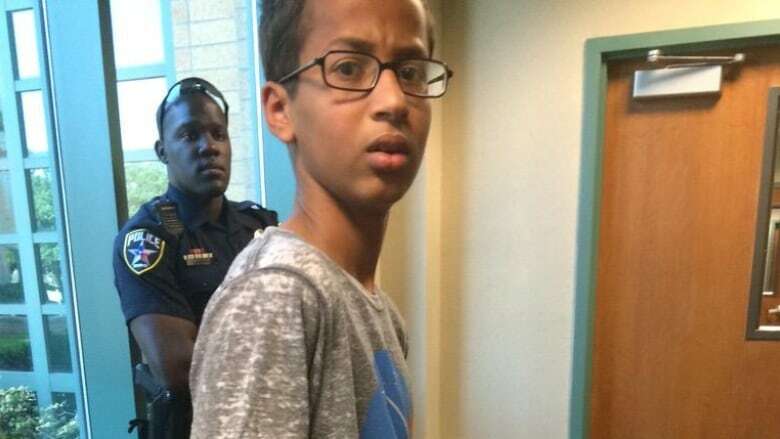 Hi <a href="https://twitter.com/IStandWithAhmed">@IStandWithAhmed</a> ! I'd love you to join us for our science show Generator in Toronto on 28 Oct. There's a ticket waiting for you. Hadfield reached out to Ahmed Mohamed on Twitter using the hashtag #IStandWithAhmed, which was trending worldwide in the aftermath of the 14-year-old boy's arrest. The Grade 9 student was arrested in Irving on Monday. "It made me feel like I wasn't human. It made me feel like a criminal," the teen told the Dallas Morning News. The arrest elicited outrage online and gestures from U.S. President Barack Obama, NASA employees and celebrities – including Canada's most famous astronaut. Hadfield is hosting Generator, a "science-based variety show," at Massey Hall Oct. 28. "I'd love you to join us for our science show," he tweeted Wednesday. Others have jumped in offering to pay for Ahmed's flight to Toronto and hotel stay.